The 9th official game released in the series (maybe 10 because TH 7.5). 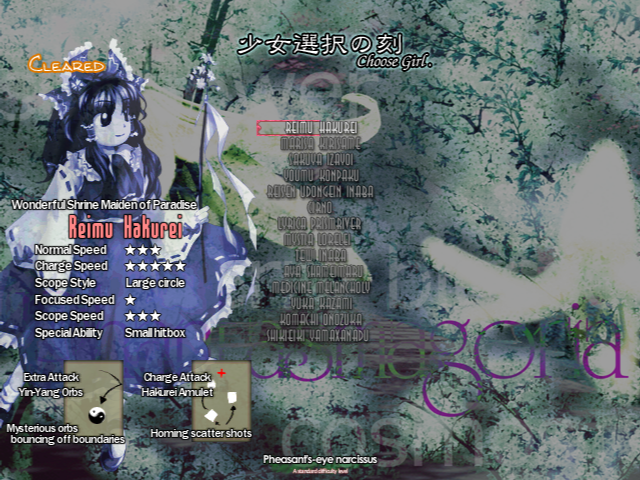 This game shares similar gameplay style as TH 03 where it is a versus vertical scrolling danmaku. The story happens in spring where flowers have bloomed. However, The flowers that should not appear in spring are blooming as well. Once again, it is time to seek the truth behind the situation. Upon reaching Muenzuka, The heroine discovers that the spirits with no vessels are the one that cause the flowers. 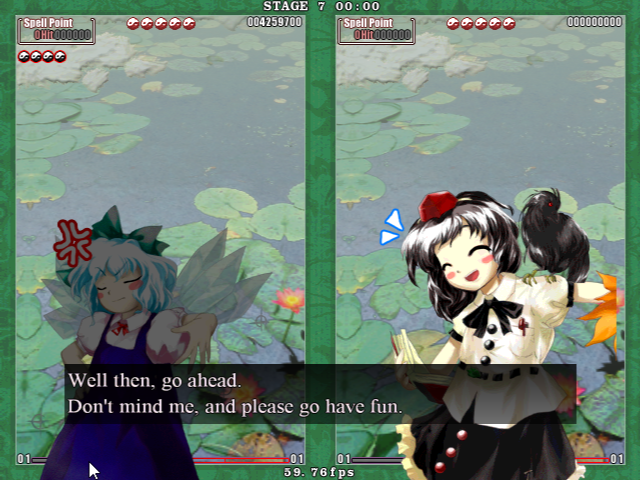 Since it is a versus danmaku game, it has wide choice of characters to choose. Having more than 10 characters to choose (including the unlockable ones), each character will have their unique shooting styles and bombs. 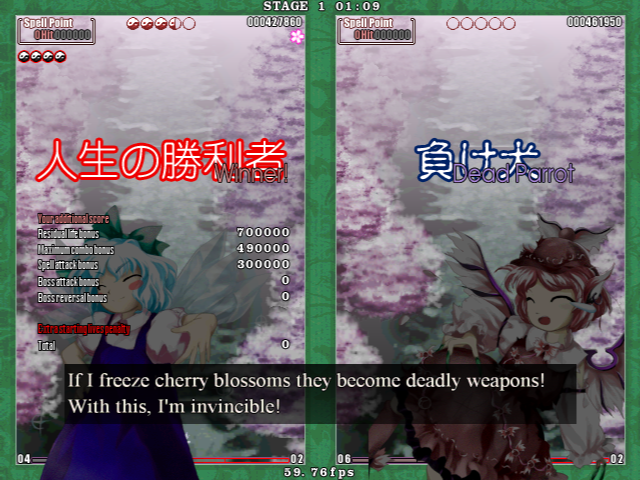 There are 3 new characters introduced into the game which are Aya Shameimaru, Komachi Onozuka and Shiki Eiki Yamaxanadu (final boss), Also, it is even more difficult than TH 03. 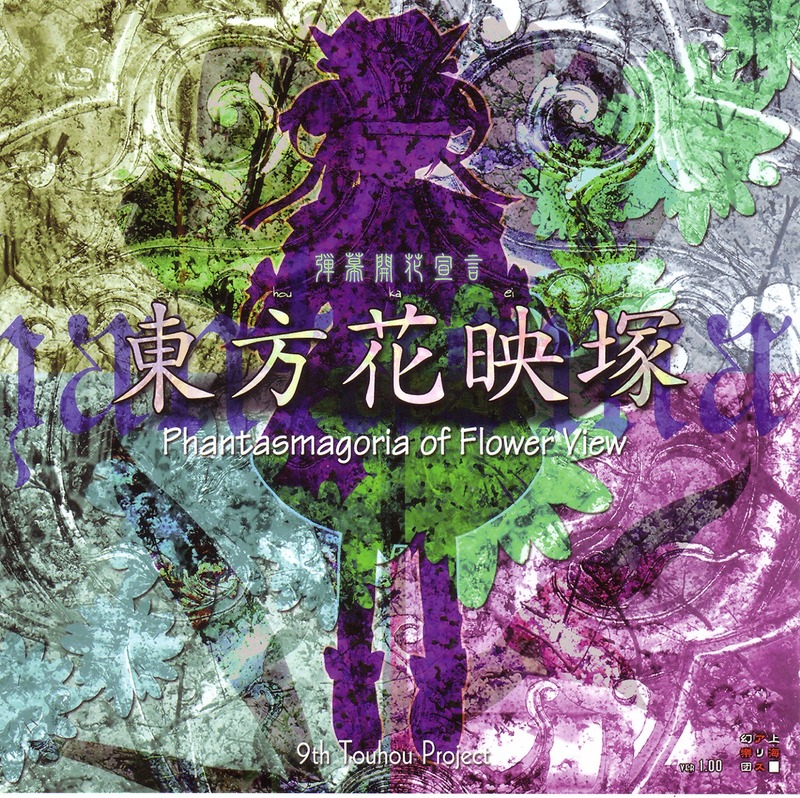 There is, a character appears no appeareances since TH 05 which is Yuuka Kazami. This game also have multiplayer function which allows pvp. 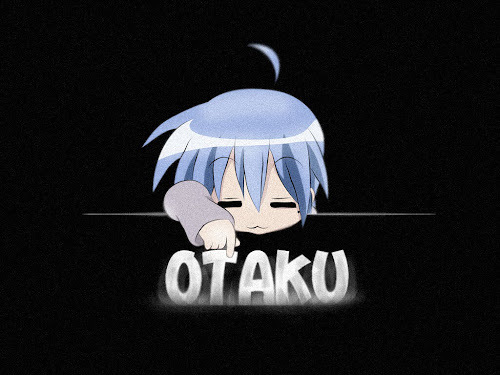 Danmaku pvp... Interesting eh? For the Extra stages, the player will have to clear Normal Mode (which is very hard to me) and as far as I known, there are no Unique boss to the stage. It's just that the stage is run without any continues allowed. My view on this game? RNG. This game is so random because you can only pray that the enemy under AI control actually make mistake and die. Sometimes the AI can move like no human can within vast amount of bullets. My only strategy for this game is shoot and don't get hit until the enemy die eventually. Just don't die before the enemy.